Time to call in some troops! This article will cover the changes that we had to make on the Khaldoun job and how we compensated without compromising the integrity of our swimming pool structure. It’s advanced construction techniques at its finest! If you’ve read our image description (above) you have noticed we had to change our plans. 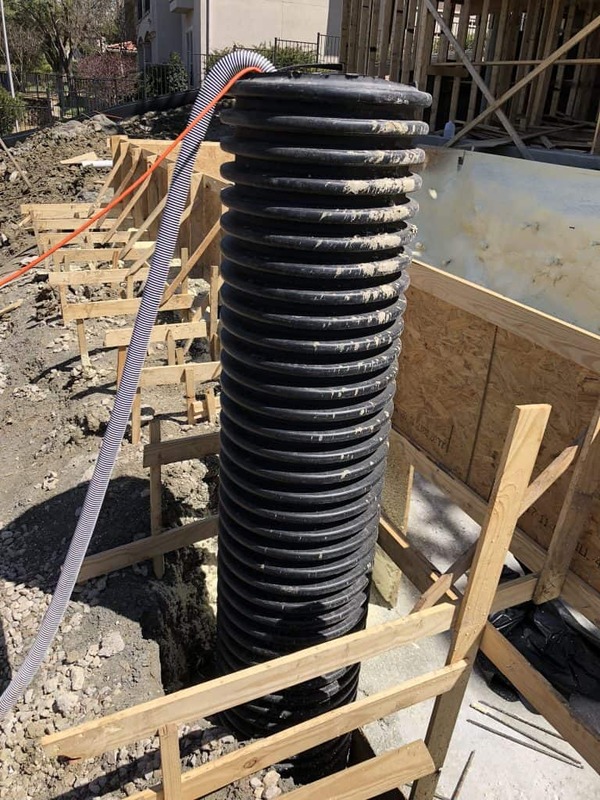 Sometimes, when you’re in the pool construction industry, there are existing conditions that you aren’t made aware of until your already building. In the case of the Khaldoun job, we experienced some interesting soil conditions, to say the least. On our last article, we spoke about our plans to install 1′ wide by 20′ deep piers. These piers were initially designed by soil engineers to drill down to bedrock and be placed beneath our Void Carton. We created this design to protect this pool shell from a high probability of soil movement – Las Colinas is notorious for it. It wasn’t until we poured our concrete pillars and let them set & harden that we uncovered a problem. Pop! When we came back to the job site after the weekend, there was a concrete pier jutting out of our soil by 6′! Now how can that be? Soil Engineers are very talented teams that investigate our soil conditions and help us make accurate estimates prior to excavating any dirt. These plans are estimates of what the soil conditions could be – not what they will be. In this instance, there was a lot of water closer to the surface than what our soil engineers originally predicted. This caused our piers to float and pop out of the soil. That being said, it was time to change some plans! This image shows our water excavation equipment. In the pool industry, we refer to this as a permanent sump pump. This design is often used to remove water from collecting beneath our pool structure. Water is much more enjoying in your pool than under it. Pool Shells are waterproof structures that keep water under, but like to float if water gets beneath. Definitely not a situation anyone would ever want to find themselves in! 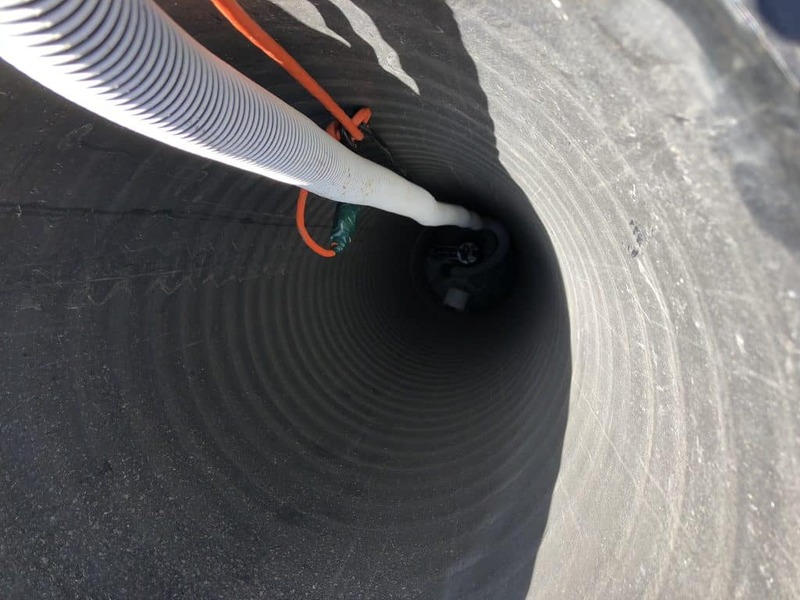 Peaking down into our drainage pipe, this nearly 20′ drop leads to our water excavation system. Our sump pump is designed to remain in this chamber, even after our pool is built. It will operate with a float assembly that activates and removes water to a storm drain if the water level gets too high. It’s another step that we take to ensure our customers receive a pool that is designed to last. We take the extra step to build our pools the right way! At Summerhill Pools, we have over 30 years of experience in the swimming pool industry. When life gives you lemons, we love making lemonade. Needless to say, it’s not the first time we’ve encountered volatile soil conditions in Texas, but we’ve got the skills to overcome the task. Because these concrete piers were already poured, we cut the tops off of the piers deep enough down to essentially eliminate them from the project. Secondly, because we no longer had any need for piers, we didn’t have a need for our void box. Nix that off the list! Moving forward, we are firm believers in constructing firm and very strong foundations for our swimming pool shells. Since Texas soil conditions are so volatile below the surface, we needed to construct a very sturdy above the surface foundation. To accomplish this, we installed a 12″ Concrete Slab with 1/2″ rebar laid in 6″ squares to create our pool base. 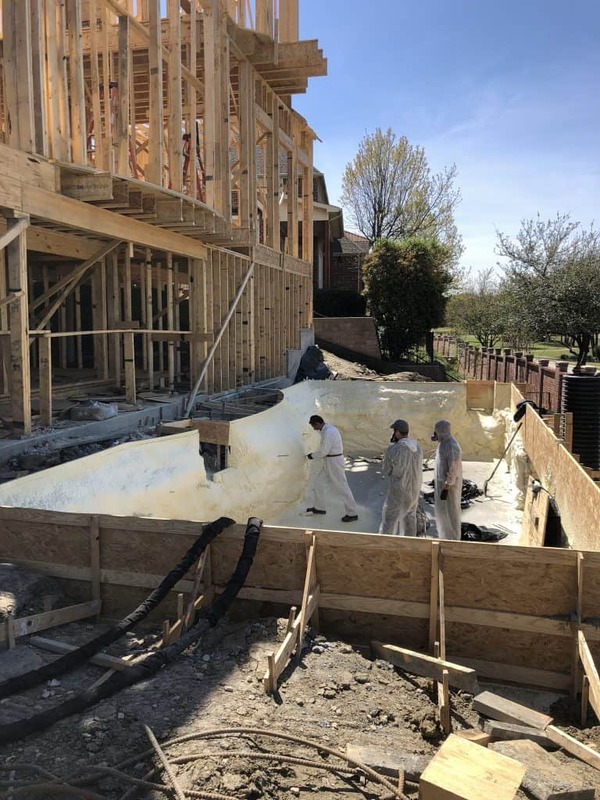 We then called in advanced Geo Foam teams to create a flexible base outside of our pool shell (still to be constructed)! 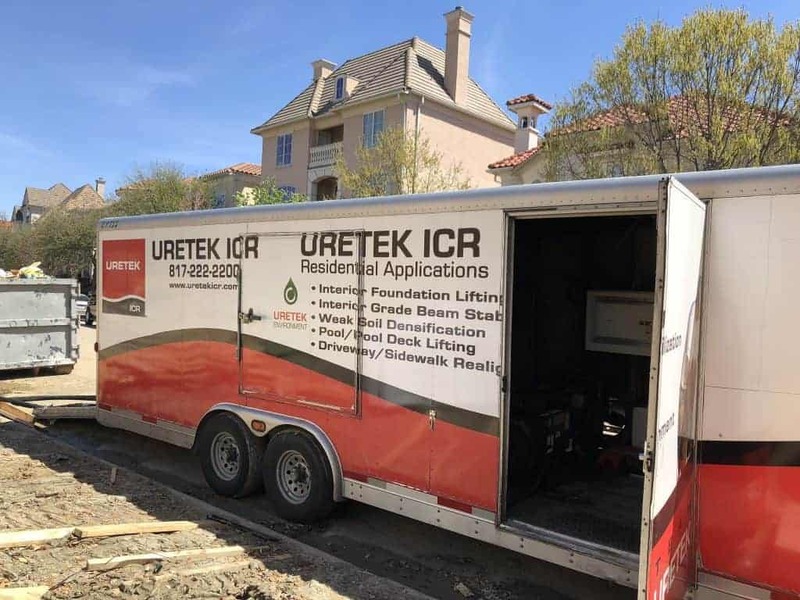 This team from Uretek is trained to install Polyurethane Foam to level houses, repair foundations & stabilize soil. In our instance, we contracted them to create a “Foam Cushion” around the shell of our pool. This creates a tough barrier designed to withstand expansive soil movements and protect our pool shell from cracking. It’s an added step, but it’s why we love doing what we do! What exactly is Geo Foam? “Geo Foam” as we like to call it, is Polyurethane Foam – the same stuff that soil experts use to life houses. This foam is non-corrosive, expansive, and very resilient to ground movement. For our purposes, it operates as a resilient barrier that we have installed all around our swimming pool shell. This makes it much more resilient to ground movement and protects our pool shell from cracking and fractures. At Summerhill Pools, we have a long list of reputable vendors that we partner with to create swimming pools that last! Our sub-contractors use the best materials and construction techniques that align with our reputation and company mission. We don’t cut corners and we invest our time and effort to create structures that our customers can love, trust and enjoy. We contracted the Khaldoun job to Uretek. This company specializes in Concrete Lifting, Foundation Repair & Soil Stabilization. At this point, you might be asking yourself “why are these guys going to such lengths to build a pool?” Not all of our swimming pools require such in-depth construction techniques. But of course, there are always those instances where conditions are tough and in order to build a swimming pool the Summerhill Way – we invest in structures that are built to last. In the case of Las Colinas, this side of town has a terrible soil reputation. 99% of homes built in this area are required to have piers drilled down to bedrock. Keeping with the same Las Colinas standards, we are required to use similar construction techniques, as conditions allow, to ensure that our structures are built to last. Whew! We know that that’s a lot to chew on an may be more information than you asked for. We love working on challenging projects and going to additional lengths that your standard pool builder would prefer to shuck off. It’s a reason that our customers love and trust us. If you enjoyed this article, we invite you to read through our digital library of other related industry articles.